Popular coffee roaster starts trial run for pre-packaged coffee. 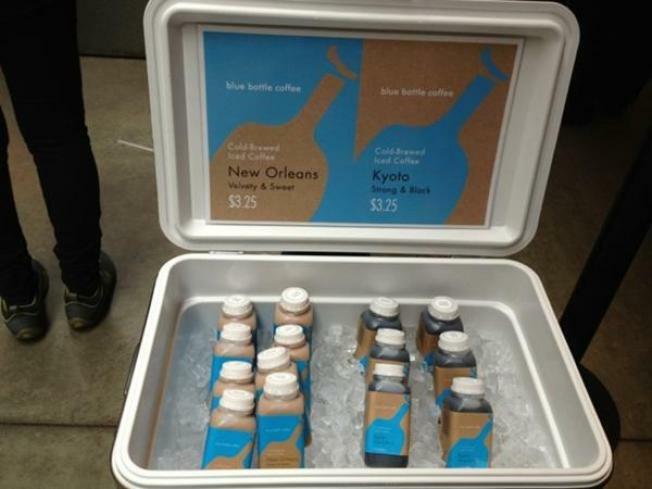 Blue Bottle is now selling bottled iced coffee. If all goes well, the Oakland roaster will expand its service possibly to local grocery stores. Not often enough are there positive stories being reported about Oakland. There are a lot despite the headlines and one Bay Area company that keeps doing its part to flip the switch on a city with negative perceptions a mile long is Blue Bottle Coffee Company. Based near Jack London Square, the company has a loyal and devoted following at its eight Bay Area locations, including its mobile kiosk. Now owner and coffee purist James Freeman tells Inside Scoop that he is expanding his coffee empire by finally offering prepared iced coffee to go. Freeman says he has long wanted have Blue Bottle products at local grocery stores but he has "cringed at the though of good beans withering away on shelves for too long." So for the past year he has been perfecting his iced coffee recipe and now two different flavors are being offered at Blue Bottle's Ferry Building location in San Francisco and at its roastery in Oakland. The strong and black Kyoto flavor and the velvety and sweet New Orleans styled ice coffees will be sold on a trial basis and if the sales go well, production will be ramped up and served at other locals. Both flavors are cold-brewed and pasteurized near the company's Oakland roastery. "It’s an Oakland product," Freeman said.